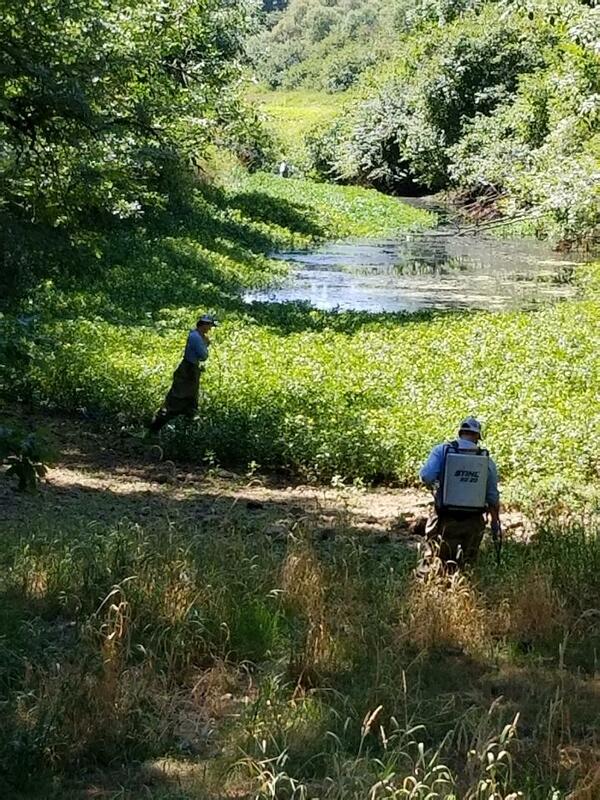 Scope: IRM has been hired by the Willamette Riverkeeper to start a multi-year project treating invasive Uruguay water-primrose (Ludwigia hexapetala) at the Oregon Department of Parks and Recreation, Willamette Mission State Park. The ecological threat posed by this species is becoming an ever increasing problem as it spreads throughout the Willamette River system. The few remaining legacy backwater channels of the Willamette River essential for salmonid reproduction, water quality, habitat for birds and amphibians are being choked out by Ludwigia. Licensed pesticide applicators deployed a host of restoration tools including our 6×6 UTV Intelli-spray, canoe hose & gun and backpacks. Applicators using IRM’s Intelli-spray with 700’ hose and 100 gallon tank was able to cover all necessary populations from the access road on the western bank of the lake. The initial treatment covered over 44 gross acres of slough, wetland and streambed and took roughly 7 days to complete. Over the course of the next several years, the goal of this project is to restore the ecosystem functions of the lake as well as improve fishing and boating recreation for park visitors. Click here for more detail and a copy of the sign provided by the Oregon Parks and Recreation Department, at the project location. 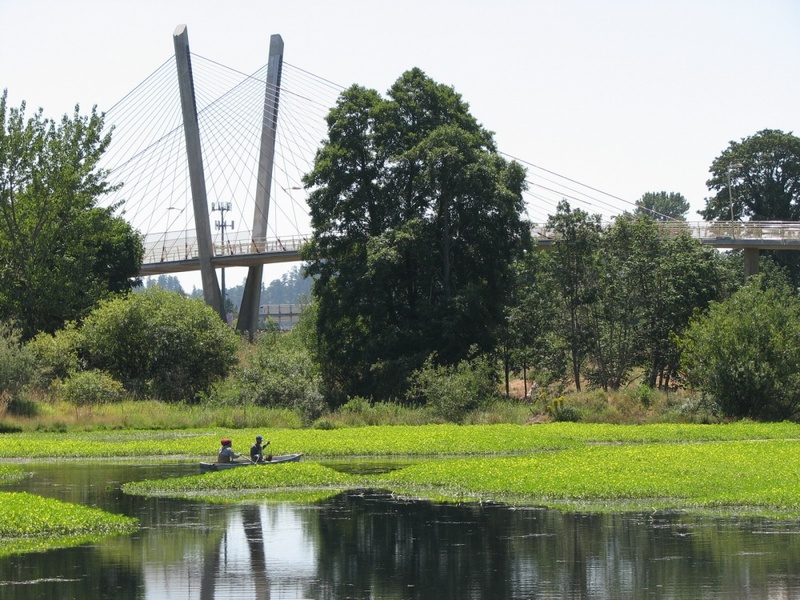 Scope: IRM was hired to control Ludwigia peploides along the Willamette River for a three year period. IRM continued treating the invasive Ludwigia at BSWCD’s Stewart Slough Complex during the summer of 2016. The project area consists of a series of side channels, backwaters and gravel ponds near Corvallis. 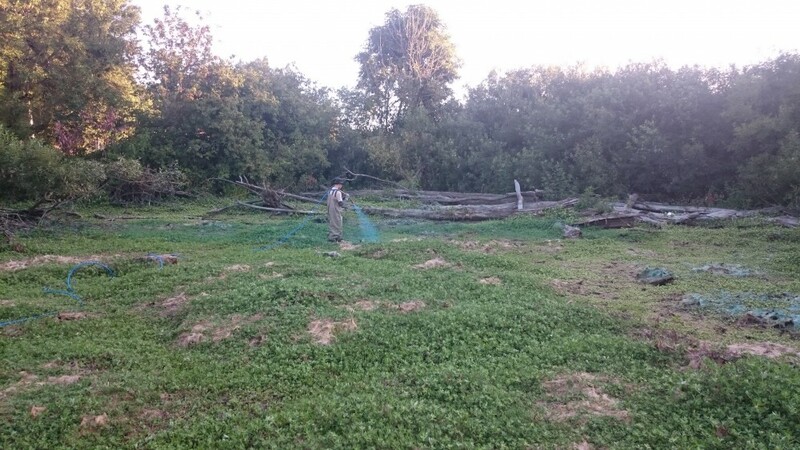 In order to treat the dense populations of Ludwigia in these often remote and difficult to access areas, IRM is using our tractor-mounted Intelli-Spray. This setup allows IRM applicators to have up to 700′ of hose with 120 gallons of solution for application. In addition to the use of our Intelli-Spray set up, backpack application was completed in areas that were either inaccessible or sparsely populated. During the 2016 field season, IRM was able to retreat the initial 240 acres treated in 2015 and complete an initial treatment on 100 additional acres of infested habitat IRM looks forward continued success managing Ludwigia in future years of treatment under this contract. Scope: Beginning August 2010, IRM was hired to complete an aquatic species control project within various locations of the Delta Ponds complex in Eugene. The project consisted of navigating to locations of known populations of both Yellow Flag Iris and Purple Loosestrife. IRM managed a restoration crew of six men, aided by the use of chest waders and canoes, the crew cut live vegetation of the emergent plants downto the just above the surface of the water. The crew applied a concentrated aquatic registered herbicide on the cut surface of the plants, ensuring that no herbicide dripped into the water. All viable noxious weed seeds from the plants were bagged and hauled off the site for proper disposal. During the summer of 2011, IRM was re-hired to continue treating Ludwigia hexepetala, yellow floating primrose. IRM crews sprayed aquatic labeled herbicides along six water bodies in mud flats and shore line areas where the plants were exposed due to summertime low water levels. IRM partnered with the Oregon Department of Agriculture and contract herbicide applicators, to complete the first of four anticipated phases to eradicate the uppermost known population of this species, on the Willamette River system. During the fall of 2013 IRM will follow up with a re-treatment of the entire area and funding depending, IRM will repeat the treatments in 2014.Other crews were hand removing the plants from standing water. In the spring of 2013 IRM developed a management strategy for the eradication of Ludwigia hexepetala, which incorporated the primary components of integrated pest management. IRM crews hand pulled isolated and individual plants which were growing among native species, spot sprayed established plants along the shore line and broadcast sprayed plants over open water with the use of boats and high volume herbicide dispensers. Scope: Initially discovered in during an Early Detection Rapid Response (EDRR) inventory in 2010, IRM treated a large population of yellow flag iris in 2012 using a combination of integrated pest management (IPM) techniques. With the help of a three-person restoration crew, IRM hand pulled over 2,000 lbs of rhizomes, completed a foliar treatment of plants on dry ground, and cut and wiped plants that were emerging from water. 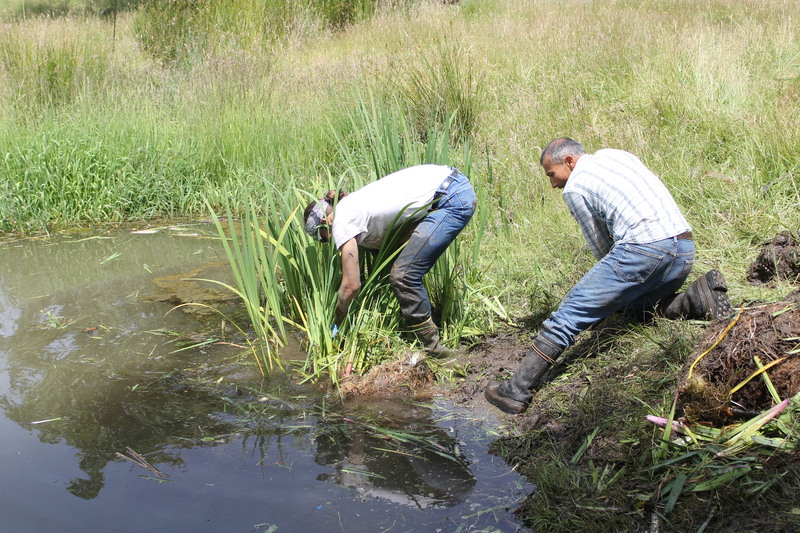 Scope: In the spring of 2011, IRM assisted the Institute for Applied Ecology in the hand pulling of false brome throughout a portion of riparian habitat managed by the Bureau of Land Management in Benton County, OR. Throughout the course of this project, IRM directed a five person labor crew in the proper identification, proper removal techniques and disposal of false brome. 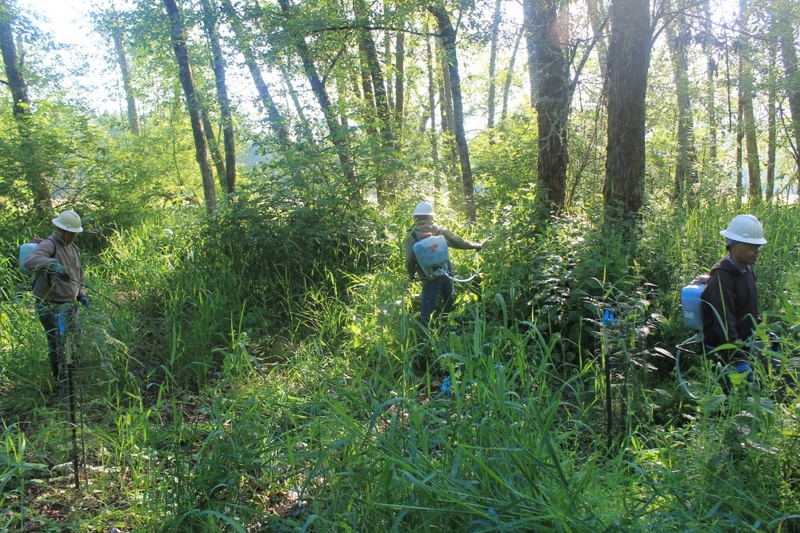 Scope: IRM was hired by the McKenzie Watershed Council to complete a riparian release spray on the McKenzie River Oxbow within an area of recently planted native trees. An IRM restoration crew, consisting of six licensed herbicide applicators, treated several species of noxious weeds including knapweed and reed canary grass, which were overtopping the new plantings. The site is an old oxbow of the McKenzie River that changed its course in 2010. Scope: In 2012, IRM completed treatment of false brome under the MFWWC false brome eradication contract. This project consisted of using ArcPad GIS to navigate in the field and locate & map existing populations of false brome. Populations were then treated with herbicide to prevent further infestation.